The HML Group provides a range of property services to the UK commercial and residential sectors, including property management, insurance and ancillary services. When the Group’s mission-critical database started producing errors, Blueberry migrated the backend data storage from Access to Microsoft’s SQL Server. HML had an Access database that quickly became mission-critical as the business grew. When the database started producing ominous sounding errors, HML contacted Blueberry to find a short-term rescue plan to stabilise the database. It quickly became apparent to Blueberry that Access was not a suitable platform on which to build HML’s mission-critical multi-user databases. Blueberry recommended re-implementing the project and migrating the backend data storage from Access to SQL Server. The new system is a true three tier database with a WinForms .NET client tier, a .NET web services middle tier and an MS SQL Server backend tier which is written in Transact SQL. The client and middle tier use .NET 2.0. 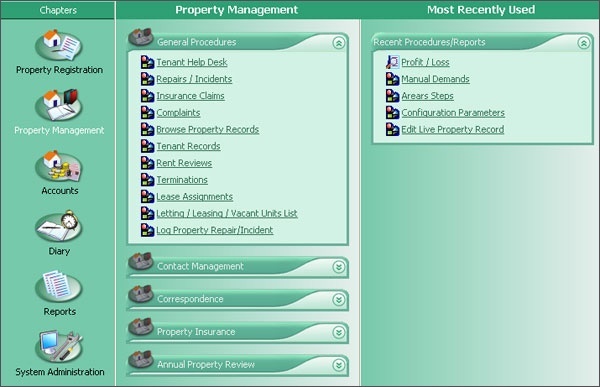 The new property management system has a true three tier database, which has become the core of HML’s strategy for business growth. The database has become the core of HML’s strategy for business growth. Its success has led to an on-going relationship between Blueberry Consultants and HML, resulting in continued developments being undertaken by Blueberry as HML’s systems have grown in line with the success of their business. Got a Project? Not Sure Where to Start? Get Our Expert Advice Instantly! Don't worry if you don't know about the technical stuff, we will happily discuss your ideas and advise you.